Every business wishes to expand their target market in order to earn more profit and help the company grow in size. One of the most effective ways of doing so would be to explore the world of prospecting. When it comes to succeeding in sales prospecting, you have to consider that everyone you meet, from your family down to the people you have just met now, is a possible prospect for sales. You also have to be ready to hear the word No! over and over again in different tones. One good trick when it comes to prospecting? Do not take everything in an emotional manner. When you get rejected, just quickly move on to the next prospect. Time is precious, so make sure you do not waste any of it. Since this action plan for increasing sales needs to be taken seriously and with careful consideration, we would like to help you out. 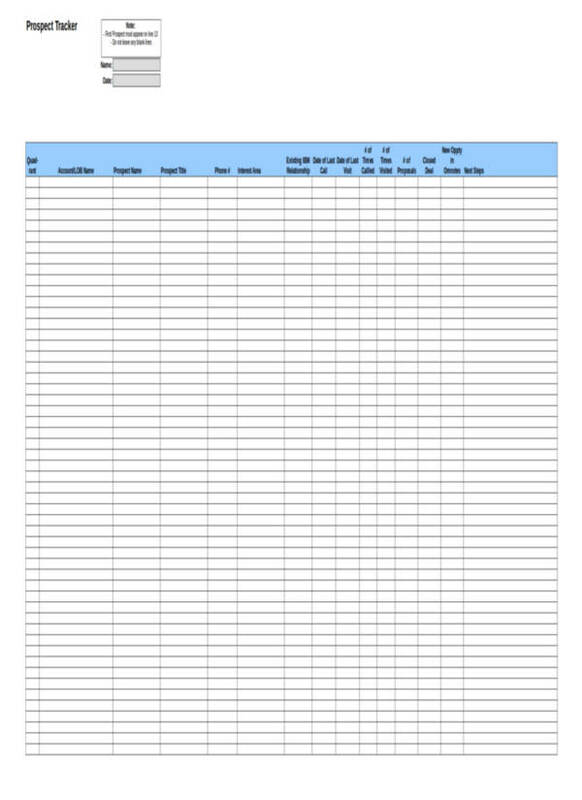 There are a couple of blank spreadsheet samples that we have also included in this very article to help you make your prospecting task a whole lot easier. Tips and guidelines? We have included them here as well! You ready to find out and learn more? Just make sure to keep scrolling for more information. Sales prospecting is a business process wherein sales representatives perform outbound calls or perform email marketing in order to create opportunities and gather leads for account executives. The goal is to search for potential customers, potential clients, or potential buyers in the hopes that a new business will be developed. The main goal when sales prospecting is performed is to turn these prospect into long-term, loyal customers. The more loyal customers, the better as revenue will always be generated. Want to learn more about email marketing? 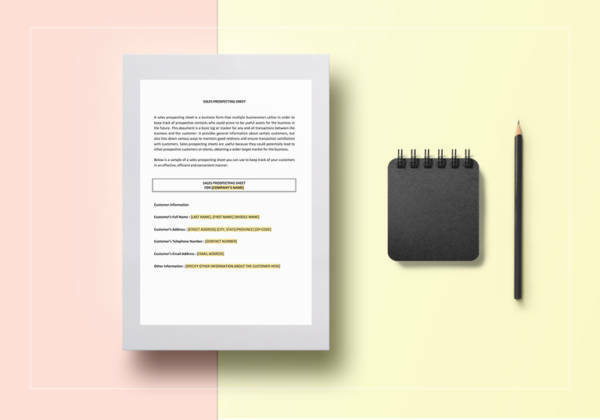 Read up on our article about Sample Marketing Email Templates. Leads. Leads are potential customers who may have expressed their interest in what your company offers. This can be displayed behaviors such as constant browsing of the website or social media site, downloading from the website, commenting on the website, inquiring about the products available, or messaging. Prospects. When leads become qualified as potential customers, they are now considered to be prospects. Leads become qualified once they align with the person or the characteristics of someone who falls under the target market. Prospects do not necessarily have to be a lead as some prospects are categorized to be potential customers despite having little to no interaction with the company. Research. Doing your research can help you determine the quality of your leads. Typically, in evaluating your leads, you would have criteria that you would use in order to determine whether a lead or a prospect will become a customer of your company. You can either do this evaluation manually or via a customer relationship management (CRM) software. Prospect. Make sure that you aim to have a good connection with the people who interact with you. In order to do this, you need to assign a gatekeeper and a decision-maker. A gatekeeper is a person who is in charge of relaying or blocking certain information from reaching the decision-maker. A decision-maker is a person who is in charge of making decisions regarding sales. Connect. Connecting means making that very first phone call or sending that first email. The first phone call or email is crucial since this is the step where you will be able to gauge whether the potential lead can be considered for the next step of the sales cycle. Educate and Qualify. Make sure that you evaluate and qualify the needs of the prospect. You have to determine the pain point in order to efficiently identify the needs and supply more value to said needs and be able to move them to the next step of the cycle. Succeed which means that you have turned the lead into a customer (prospect bought/availed of product or service). This is your main goal when you close the sale. Lose or if the buyer does not end up buying the product or service from the sales representative. Want to know what your customers think about your services? 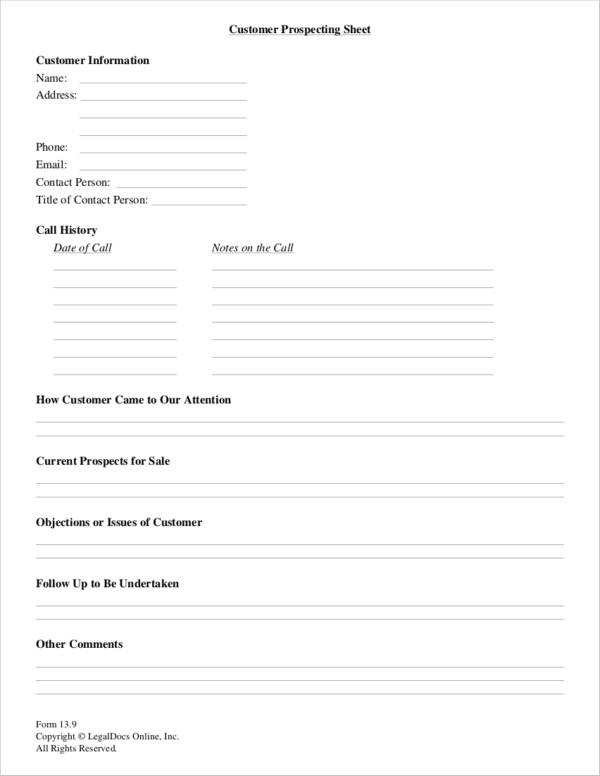 Have them fill out a sample customer feedback forms and use the results as a means of improving your lapses. There are two common methodologies used when it comes to sales prospecting: outbound prospecting method and the inbound prospecting method. To give you a better example of each type of method, we will give a couple of examples of each type of method. Outbound Calling. This is calling potential customers and discussing with them the product or service that you are offering. Social Media Spamming. This refers to sending unsolicited social media messages or emails in order to sell a product or a service. In doing outbound prospecting, you need to make sure that you do your research well. This is a time-consuming process but you want to make sure that you are well-equipped with enough information about the potential customer and you will be able to easily establish a connection. Warm Emails. This refers to emails sent to potential customers who have been determined as leads or those who have expressed familiarity with the product or service available in your business. Social Selling. This refers to sending social media messages in order to explore your relationship with a lead. Through social media messaging, you can easily answer queries that they have if they have any. Since inbound prospecting is already done with leads, this means that previous interaction, plus contact information are readily available, the research process is way shorter. Through the previous interactions, it will also be easier to assess the interest and purchasing behavior of a customer. This makes reaching out more personalized. Make sure that you have a record of all the outbound calls and inbound calls that have occurred during the day. You may check out How to Create Call Log Template and Sales Call Report Samples for more information. Outbound Prospecting vs. Inbound Prospecting: Which One to Choose? Inbound prospecting is way better than outbound marketing as you have some of the most vital information ready right in the palm of your hands compared to outbound prospecting where you have to do your research from scratch. In marketing, time is of the essence, so you have to be quick in terms of growing your market. Who likes getting cold calls nowadays anyway, right? Cold calling will just end up wasting your time and that is something that you can’t afford right now. Performing inbound prospecting also helps you to pay more attention to your buyers and understand what they need and what they want. For more information, check out the Difference between Inbound and Outbound Marketing. Want to learn more about how you can effectively market your products and services via telephone? Check out Telemarketing Tips for more information. How Often Should Prospecting for Leads Be Done? Most of the time, sales representatives prospect for leads on a weekly basis in order to hit quotas easier and on a regular basis. It will also depend on the needs of the company. Prospecting is usually a routine type of work that ensures that you have a constant record of old and new leads. The more leads you have, the highly likely your market will grow. So what is the importance of sales prospecting? There are two reasons why: they increase the volume of your customers and it helps to increase your revenue. Given that you were able to properly carry out the sales prospecting process, you are sure to attract more buyers and potential customers that you can turn into buyers. If prospecting is not performed on a regular basis, you are sure to lose buyers. Increasing your pool of buyers can make it easier for you to add revenue to your business. It’s better to have more potential buyers waiting. The more the customers equal to more revenue. Every prospect or lead that becomes a buying customer, in the end, helps to increase the sales production of your business. With more revenue, the bigger the chance of helping your company grow over time. This is also a win-win situation for both the company and the sales representative because the sales representative can get more commissions while the company is able to increase their profits.